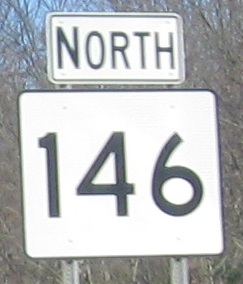 MA 146 and RI 146 are the shortcut from Worcester to Providence, Albany to Providence, etc. RI 146 during the 1980's and 1990's was slowly upgraded toward full freeway, and MA followed suit starting in 2002. The southernmost traffic light in MA is now at Boston Rd. 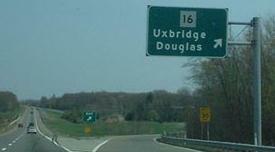 in Sutton (thanks to Ken Depot for this info), and there is still one section in RI yet to be upgraded. Probably the only button copy you'll find, NB. Two SB BGS's, courtesy Doug Kerr. MA 146/122A at the interchange with US 20 and I-90, during the reconstruction of that area. This was newly built as Mass. 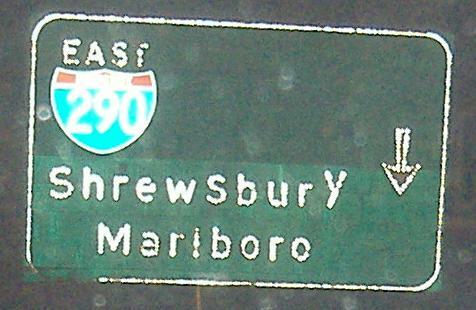 Pike (I-90) Exit 10A, at the time it started to undergo reconstruction so that MA 146 could be made full freeway (i.e. to eliminate the traffic light here). There have been a lot of changes to US 20's routing, including running it along about half of the ramp that's supposed to go between 20, 146, and I-90, and, as the picture shows, US 20 has been sliced in sections above 146 as it's brought up to freeway standards. You can even make out an orange construction sign warning US 20 traffic to curve to the left. 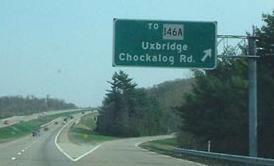 Trouble with that sign is, at the time it was photographed (2/03), it was facing MA 146, and thus not very useful. 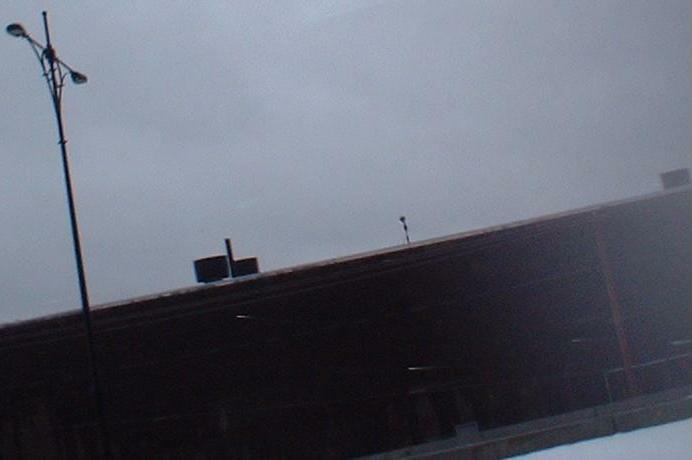 Construction was finished in 2005. 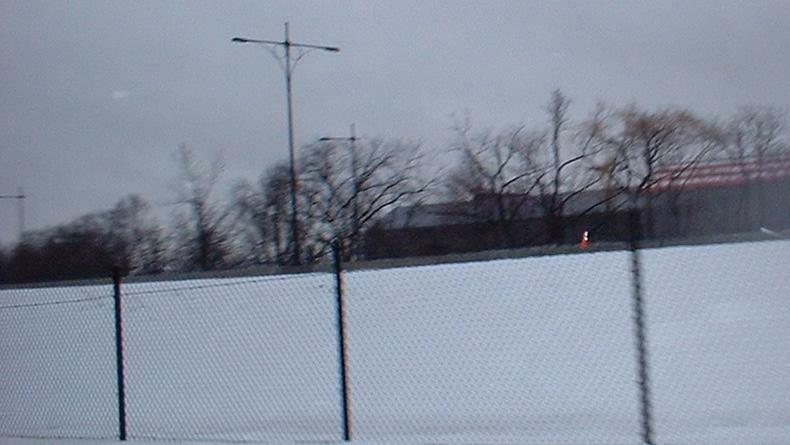 Shots of the freeway that was about to open, in February 2004. The lampposts look lovely, and probably all that was needed over this approximately two-mile stretch was the final coat of pavement and some landscaping. Caught! The contractor couldn't hide all the signs, so this BGS snuck out on the Blackstone River Rd. overpass visible in the background of the second freeway picture above. You can see that even the traffic signals are ready for the highway to open - the left turn phases are covered for the time being. However, the "RI" looks to have problems, the left arrow is probably quite small, and the sign is missing mention of MA 122A. The freeway is now open, and this photo is courtesy the windmill in the distance. 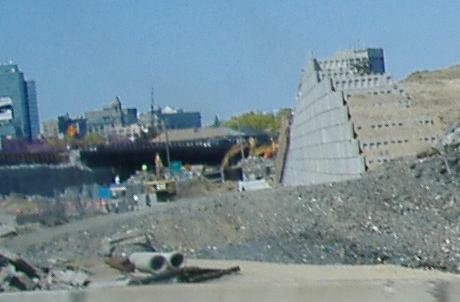 Looking back north, while traveling southbound, at a new retaining wall for the completion of the MA 146 freeway to I-290. As you can see, two-way traffic is already traveling in the future southbound lanes, as of May 2006. The northbound lanes have some distance to go, but at least the median lampposts are already in. I wonder if they turn on at night yet. Approaching the southern limits of construction and the current northern end of the four-lane freeway. Once the link is completed, Rhode Island has a few miles to bypass and both states have an intersection or two to upgrade before RI-MA 146 will finally be a full freeway (or at least Jersey freeway in some spots - driveways without cross traffic). 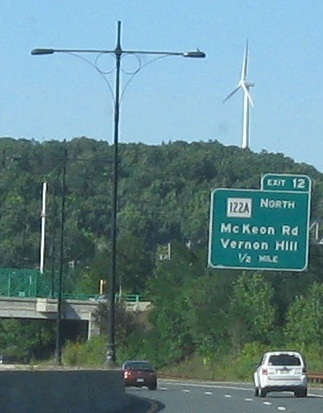 Signage dating from the completion of I-290, at the very beginning of MA 146, and while the first (southbound) one is gone now, the second (northbound) one was still there as of May 2007. The 290/146 interchange was a traffic circle until construction started.